Nathan's Real Estate Notions: Market in Full Swing! Sellers Being PAID to Move?? In an effort to end the foreclosure crisis, the Obama administration has been trying to keep defaulting owners in their homes. Now it will take a new approach: paying some of them to leave. This latest program, which will allow owners to sell for less... (to read the rest of this article please visit http://www.nytimes.com/2010/03/08/business/08short.html)! The median price of houses sold in Santa Clara County rose 21 percent last month compared to the same time last year, as more high-end homes changed hands. Sales in the county increased 4 percent last month compared with February 2009, with 804 houses sold, according to a report Thursday from MDA DataQuick. The median price of the previously owned, single-family houses that changed hands in the county last month was $510,500, up from... (to read the rest of this article please visit http://www.mercurynews.com/real-estate-news/ci_14700966). 43 Days Left! : April 30, 2010 is the deadline for the $8,000 First Time Home Buyer, and now $6,500 REPEAT homebuyer Federal Tax Credit. Click here for a video explaining how the credit works, and you can visit the website http://www.federalhousingtaxcredit.com/ to read the frequently asked questions about the credit. 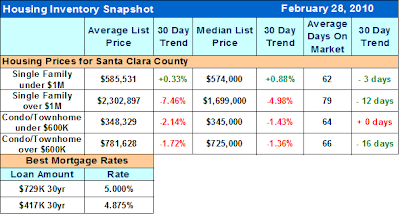 Market RecapThe chart below shows that cities east of highway 880 are continuing to have less inventory. Home prices have risen in these areas as much as 10% in 6 months. Demand has far outweighed supply. The buying season is upon us and time on market is falling! Now is the time to buy! The tax credit will continue to spur activity as well as low interest rates. Prices across the bay area will continue to rise.